You want how many cupcakes individually packaged? Every Saturday from 9 t0 3 a derelict looking building in Braamfontein Johannesburg is transformed into a riot of tempting smells and lively socialising. 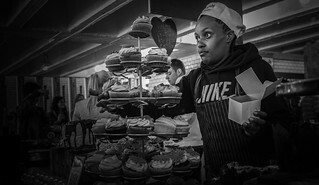 From South African favourite biltong to Spanish paella and truly jaw-dropping cupcakes; there is a variety of hand crafted food on offer.